Battle-tested TA 152. It has suffered runway rash, and has lost all plastic guns and cannons. Unlike a few occasions in the past where I felt the need to praise some planes (e.g. Extreme Flight Laser) but sat on the idea, this time I actually decide to comment on rcgroups.com. It was then only natural that I consolidated my comments into a quick article here. 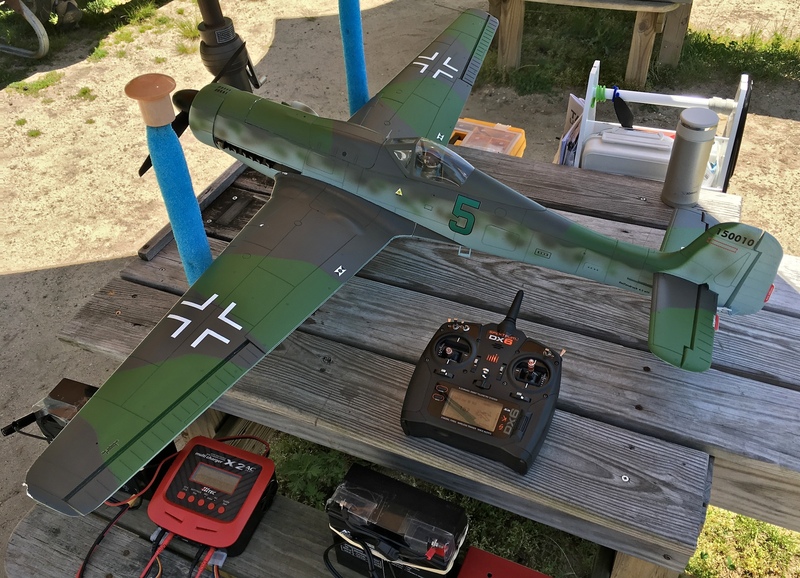 If I must use one sentence to describe this 3S-capable plane, I would say that, when run on a 4-cell 2,600mAh lipo, it turns into a graceful speed demon in the sky. Update 2017-07: the ESC on the plane they shipped me was apparently faulty. It burned up midair and the plane crashed. Sigh. After making some noises on rcgroups.com, I got a call from MotionRC. And I explained that the product pages (for the plane, for the 2-blade prop, etc) should clearly say that the 2-blade prop can only be used with the motor upgrade, as part of the “High Power Upgrade Set”. I’ve been flying for a few years now. My last few planes were 3D planes, both foamies (e.g. Night Visionaire) and balsa (e.g. Extreme Flight Laser 60). 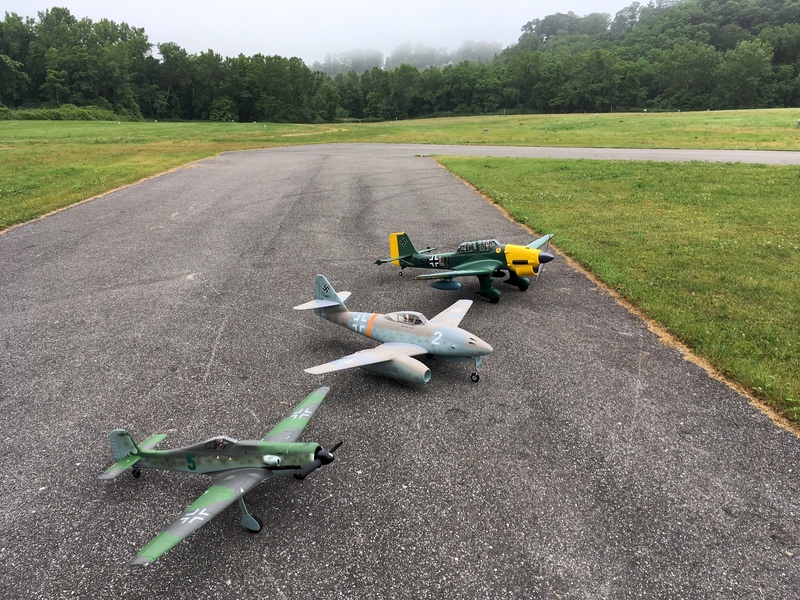 I’ve had warbirds before, but only micros and park flyers. I’ve never had a plane with retracts, nor flaps. And until I got the TA-152, I never understood folks at my aerodrome who went for speed and put GPS speedometers in their planes. I also never quite grok torque roll emotionally – I knew what it was and could articulate it, but I’d never noticed it on my planes. It all changed, when on a whim I bought the TA-152. This plane is like “poetry in motion”, and it flies quite unlike any other. Its graceful movement coupled with unusually long wings makes flying look like a sword dancer carving up the sky. I couldn’t get enough of simply cruising this plane in the sky, in ways that would otherwise have looked repetitive and boring with other planes. I did nothing else but flying this plane for the last month. The TA-152 prompted me to look into EDF jets now. I would have bought the Freewing Avanti S 80mm had it not been out-of-stock. I bought the trainer Rebel V2 70mm instead. In fact, I just maidened the Rebel today. While fun and different in its own ways, the Rebel flying experience can’t compare to the TA-152 which is in an experience class of its own. Yeah, I know, it’s like comparing oranges to apples. But the TA-152 is more fun to fly. This plane is fast, on 4S. When flying it downwind in a strong wind, if one as much as glance at another plane in the sky then back, the TA-152 could now be so far away, that one would have a hard time flying it back. I simply hadn’t flow a plane this fast and this silent. But it does make a satisfying whooshing sound. That sound is in-cred-i-ble. When you fly the plane towards you, you hear this whooshing sound. When you bank it away from you, it makes a distinctive sighing sound. I can’t quite decide if this is only Doppler effect, or perhaps the motor is braking. I can’t get tired of hearing this, the same way some formula one fans never get tired of listening to those monsters corner and accelerate. Just don’t fly this plane on 3S. It flies, but there is no fun to be had. Don’t try to do a vertical climb on 3S. The TA-152 is quite a joy to fly. It flies like a rocket on a rail. And it’s fast. But I repeat myself. Throttle at 60% with 4S is more than enough to rip the sky. I do have an Orange 6-channel receiver with stabilization on this plane, but I dialed off all gyro inputs for now. One reason is because I don’t have another channel to turn it on/off during flights. Linking gyro-on to aux input doesn’t work, out of the box with this plane, since the aux channel turns on gyro inputs with any channel output other than full flaps (it’s a servo direction problem). But the plane flies extremely well without gyro stabilization anyway. So I let it be. Having written these praises, I want to highlight that there are things to watch out for, with this plane. Most of these issues are typical of warbirds, but they are more pronounced on the TA-152. With my first few flights of this plane, something weird happened to me. It seemed like the plane always tip-stalled to the left upon taking off. I simply corrected it by applying aileron and rudder. After a few times it dawned on me that I was staring at the infamous torque roll, which until then was only a textbook concept to me. What I did wrong was to apply full throttle at takeoff, and at the same time pull hard on the elevator prematurely. The plane hopped into the air, and pretended to be a 3D plane, when it was really a warbird. The clip below between 0:04 and 0:14 shows what a torque roll looks like. The pilot is an experienced guy from my home country. He quickly corrected the mistake by doubling down on the throttle, and by counteracting with ailerons. The following pilot flying an FMS 109 was not so lucky. Back to the same video from my countryman again. At 1:03 he almost lopped off the head of an unsuspecting spectator who happened to be looking in the wrong direction, and was oblivious to the near miss. Here is another example of torque roll. It is not very noticeable in this instance. In the past I would have chalked it up to wind gusts. But now I know better. After a few more flights, I learned to slowly build up speed on the runway, and to gracefully lift off, like a real warbird would. My hero from the previous torque roll fiasco executed a perfect landing, however, at 2:50 in the same video. Smooth landing like that was not my experience in the beginning. The plane was simply too fast. It didn’t slow down much. I initially tried full-flap landing at low speed. That didn’t work out very well. I’d never used retracts and flaps before. In between forgetting to gear-down and hesitating between the degree of flaps to deploy, I had a hard time landing properly at first. Those first few landings were nerve-racking experiences for me. My wise buddy told me I should practice touch and go without flaps, and land hot first to get the feel. Then I could go half flaps. And only then full flaps. But still, I destroyed the 3-blade prop that came with the plane during a landing. Luckily I bought the 2-blade prop and spinner together with the plane. So I put it on. The plane flew even faster now. And it made landing even harder. 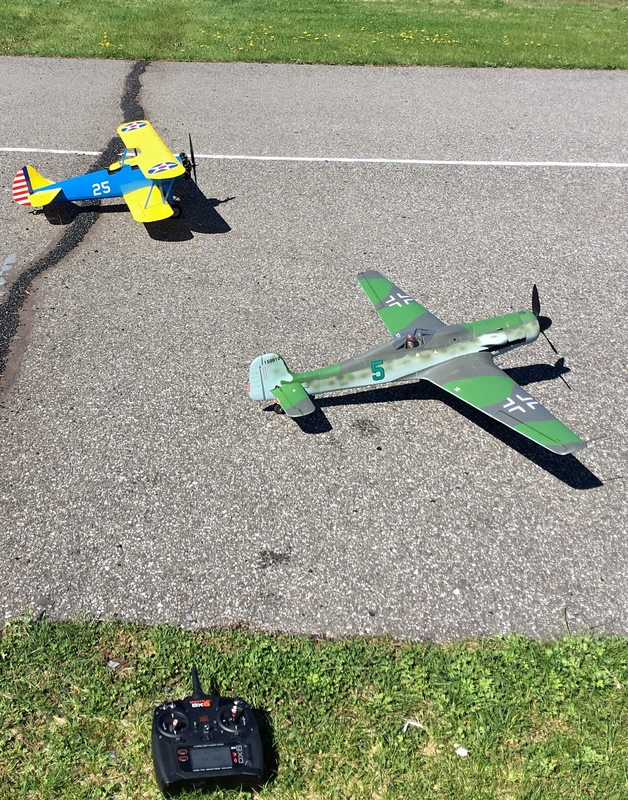 Between my buddy and I, taking turns, we chipped a small piece off the tip of one wing, and broke one landing gear. Fortunately the gear box broke off clean. I glued it back with foam-safe CA. I was off flying the plane again after only 30 minutes. The landing gear worked perfectly fine after being reattached. The runway chewed off the first 2-blade prop I put in, as the plane had a tendency to nose down when taxing after touchdown. With flaps down, the ballooning effect could be quite noticeable, especially on windy days. It took me a few days to learned to land properly. I now adjust flaps based on wind condition, and I can slow the plane down dramatically without stalls, by pulsing the throttle as needed. That’s it, for this short article. 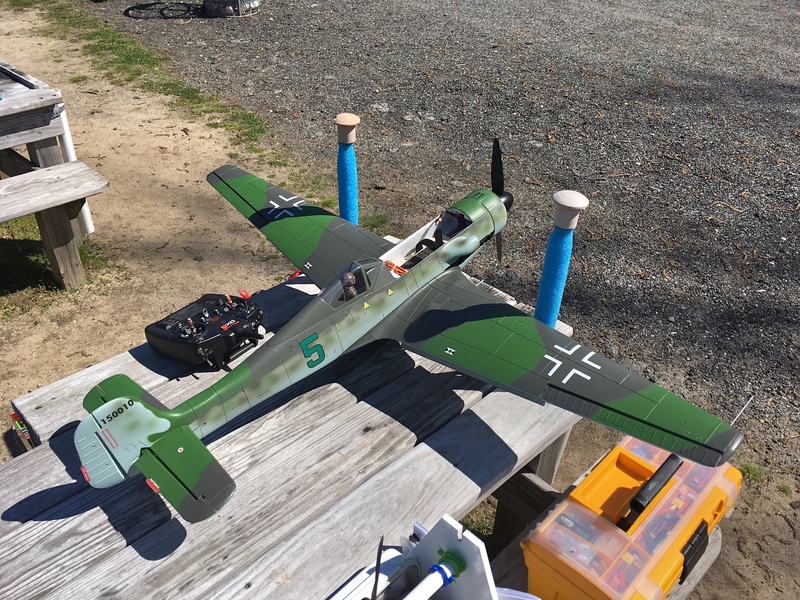 This entry was posted in RC Planes and tagged 1300mm, 3-blade prop, aircraft, FlightLineRC, Focke-Wulf, Landing, Model Aircrafts, model airplane, radio-controlled, scale, Ta 152, takeoff, tip stall, torque roll, war bird, warbird. Bookmark the permalink.